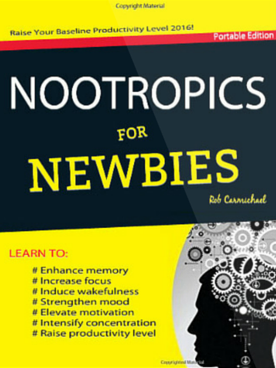 Ok, the book “Nootrics for Newbies” from a design standpoint is a huge knock off the ‘dummies’ series but from a publisher I have not heard of. As a book on “Nootropics”, this is a great over view of nootropics and a great place to start especially if your new to the topic. As a reference, the book does gloss over key topics but as suggested this is still a good starting point. For an example where I would want more information in the book; There is a ‘Schizandra Berries’ segment or the section on page 57 titled “What’s the best way to track my cognitive function…” where in this case it should articulate in the book those links and then provide the link but none the less a great primer on nootropics. 1. Schizandra Berries – I do need to expand on you’re right. This I will do and update here when added. 2. In “What’s the best way to track my cognitive function” I do provide the link to the part in the Chapter that lists 5 free online tools to do just this – with links anchor texted. the point details should be in the book. I should not need to link out to something which is my issue. it needs to work off line and have all the basics in the book w/o me clicking on a link etc. OK – I will amend this Chapter – good call, thanks for feedback.